Resources, checklists, instructions, and training materials for assessing student well-being. The transition to middle school is often fraught with emotional, social, and academic challenges for students. Often, teachers don't have the proper resources to identify students for whom this transition is becoming a problem. 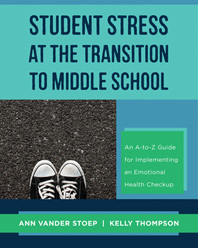 In this book, Ann Vander Stoep and Kelly Thompson provide teachers, counselors, and administrators with a complete package for implementing the "Emotional Health Checkup": a program designed to identify and help middle school students who are in need of additional emotional support. 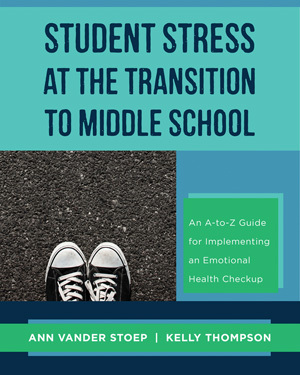 Readers will learn how to detect if a student's stress has shifted from a manageable level to an unhealthy "distress" level. They will then learn how to decide if the Emotional Health Checkup is a good fit for their school and how to get the school on board to implement the program. The book is an A-to-Z guide on how to implement the Emotional Health Checkup once the need and commitment have been confirmed. Information includes: how to engage parents and guardians in the process, carry out the logistics of classroom screening day, and develop individualized student support plans. Complete orientation and training manuals are provided.